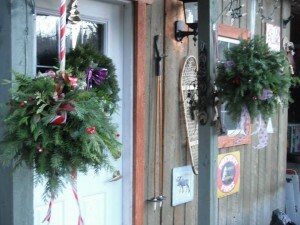 Moose Meadows Farm is very excited to introduce Kissing Balls to their line up of Evergreen Products. Our Kissing Balls are comprised of a mix of subalpine fir or Douglas fir boughs and cedar boughs. The option to include twigs (willow, aspen, birch), false box, and /or Oregon Grape exists. When ordering, please specify colour. Our Kissing Balls can be shipped. 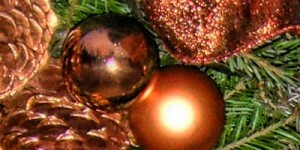 evergreen balls, Kissing Balls, originate from the Middle Ages. These hanging balls of interlocked evergreen boughs, typically adorned with a bow, date back to the Middle Ages. During that time, people wound together twine and evergreen branch into a ramshackle ball shape. In the centre of this conglomeration of boughs they placed a clay figure of an infant to represent baby Jesus. These “holy boughs”, as they were called, would be hung from the ceiling along passageways in castles and big houses to render blessings and good luck to all who passed under the bough and the holy infant. Victorians (1837 – 1901) brought back the tradition and gave it the name of Holiday Kissing Ball. The Victorians started the tradition of adding other foliage and herbs to these decorative kissing balls. The most common herbs were rosemary and lavender. These herbs were not only used for their beauty but also for their symbols of devotion and loyalty, which are two of the true meanings of the kissing ball. 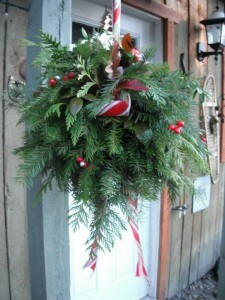 Today, hanging a kissing ball in a doorway is much like placing a mistletoe above an entryway. * The Puritans were a group of English Reformed Protestants during the 16th and 17th centuries who sought to purify the Church of England from all Roman Catholic practices.